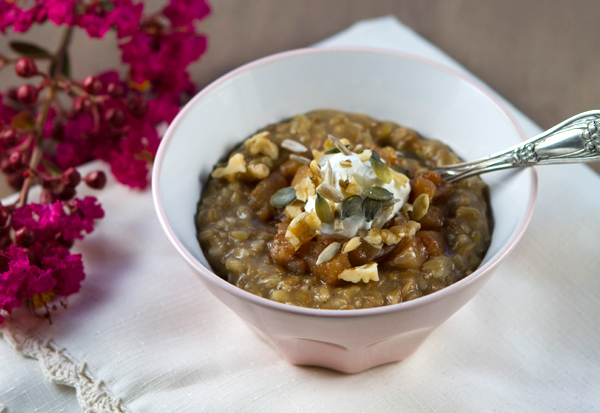 If your idea of hot cereal in the morning is a bowl of instant oatmeal or cream of wheat, there is a whole wide world of other more interesting options you are missing out on. I used to buy Bob’s Red Mill 5 Grain Cereal and though it was delicious, I decided to branch out and play with some other grains. I now create my own 5 grain (sometimes 7 grain) cereals by buying a variety of different grains at either a health food store or specialty food store, mix them together, then store them in a big glass jar in my pantry. Whenever I know I’d like a bowl of hot cereal in the morning, I simply scoop out enough grains for one or two bowls of cereal, cover them with either water or milk and then leave them in the refrigerator overnight to soak. The next morning, my cereal cooks up quickly and I can play around with flavorings depending on my mood. Rolled Grains or Flakes – Whole grains that have been steamed, then flattened and include quinoa, barley, rye, kamut, and spelt. These grains will cook quicker than unprocessed grains. Oats – Rather than sticking to basic rolled oats, you might consider oat bran which is the outer coating of the oat grout and is well known to be a great source of soluble fiber and potentially lower cholesterol levels. If buying oats, choose regular, not quick or instant oats which have been over processed. 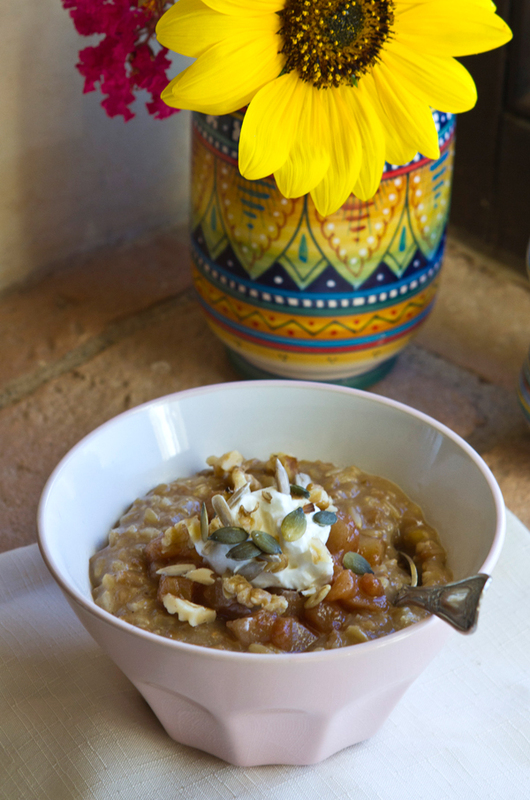 Steel cut oats are another option and these are simply the whole oat groat which has been sliced. Whole Grains - There are so many new whole grains on the market in regular grocery stores that are great in hot cereals. Some of my favorite ones include quinoa, millet, amaranth, farro, and teff. Cracked Grains – These grains are often pre-steamed so cook quicker and include bulgur, couscous, rye and barley. Sweeteners – I usually add a little organic honey or agave syrup to my cereal, but maple syrup, or rice syrup are other options as well as Sucunat, coconut sugar, or date sugar. Fruits – Dried fruits such as raisins, cranberries, apricots or figs are all tasty stirred into hot cereal. Fresh fruits such as bananas, berries, apples and pears are also delicious. Nuts & Seeds – I keep a mixture of a variety of lightly toasted nuts and seeds that I use on my hot cereal in a jar in my refrigerator. Toasted walnuts, slivered almonds, pecans, flax seeds, pumpkin seeds, or sunflower seeds are also good choices. Other Options – Some folks like to stir in a spoonful of organic nut butter, while others may prefer to spice up their cereal with cinnamon, nutmeg, or even cocoa pwder. Rolled oats are rich in protein, vitamins and minerals. Cracked wheat is a good source of fiber as well as calcium, iron, phosphorus and other minerals, and contains several vitamins, including folate and riboflavin. 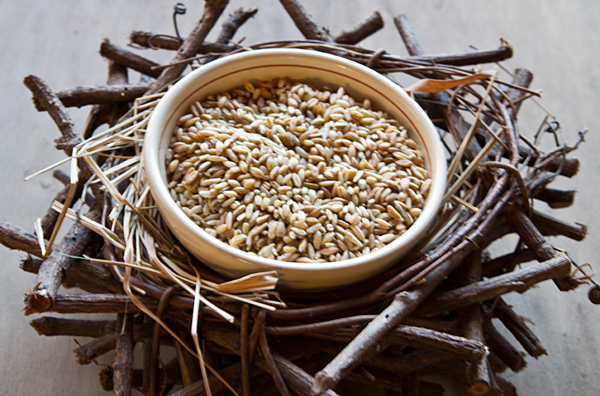 Rye contains fiber, protein, potassium, calcium, iron, phosphorus, magnesium, manganese, vitamin B-1, folic acid, thiamin, niacin and antioxidants. Mix together the oats, barley, rye, bran, and wheat and mix well. Mix together 1 cup of the 5 grain cereal mix and 2 3/4 cup of water and mix well. The next morning, place the cereal mixture in a saucepan along with the flax, raisins and honey over medium heat until simmering. Feel free to add more liquid as needed, or cook a little longer if you prefer. Once cooked, top with your favorite additives, or use my suggestion, and enjoy!